Convince your colleagues and customers of your new ideas by holding your meetings on the beach. Be inspired to develop new ideas and make new contacts. Sitting with your feet in the sand in spacious surroundings makes for a creative atmosphere for getting inspiration and new ideas. 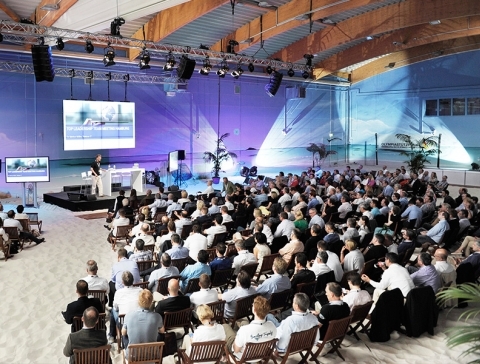 Beach Hamburg has enough space for a wide range of different meeting and conference formats for up to 900 persons. Thanks to our experienced technical partners, you can continue your work in the same professional manner as usual, even when you are on the beach. Strengthen the common identity of your team and enhance communications between colleagues and departments. 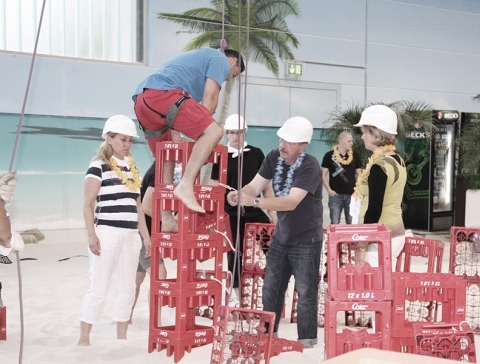 Our cheerful entertainers and moderators will guide you through exciting and individually tailored beach games, for an unforgettable day out with your team. Remove the stress factor from your guests and customers and create positive associations for your product, something which at the end of the day is all-important for sales. 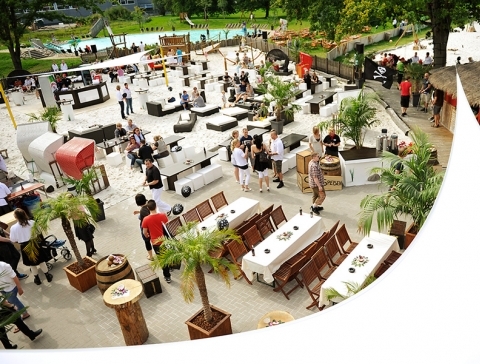 The special flair of Beach Hamburg allows you to present your products in a relaxed setting and endows them with long term association with positive emotions. 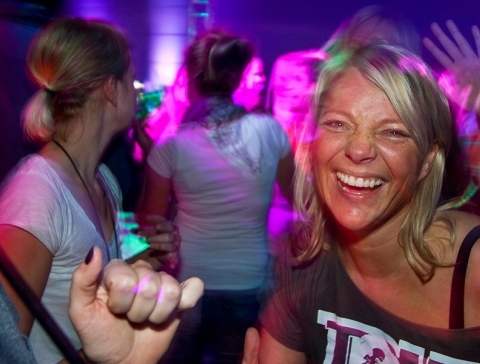 Get to know your guests in the creative and inspiring atmosphere of the beach and make lasting contacts. You really can hold your summer party on the beach without having to travel far, and yet you can still have good weather! At Beach Hamburg, you can decide at short notice whether you want to enjoy the lovely weather outside or swap to our indoor beach if it is raining. 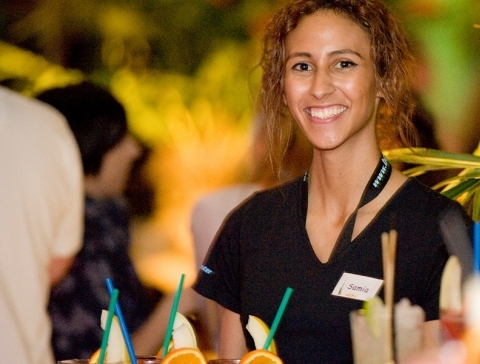 Whether you want to have an active sports event, a bit of cosy entertainment with Caribbean flair, or a bit of both, surprise your employees or customers with a very special location for your summer party. 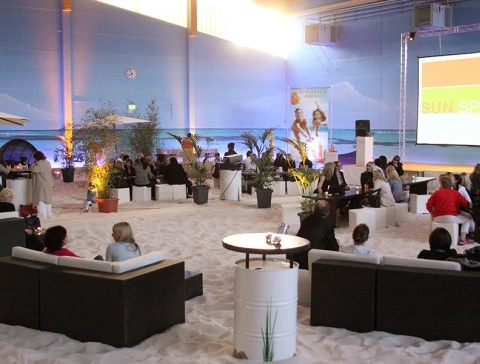 In the middle of a cold Hamburg winter, why not invite your employees or colleagues for an evening that will feel like a mini beach holiday.  With your feet in the warm sand and a cocktail in your hand, sitting under the palm trees, the daily grind and the weather outside will soon be forgotten. You can all wind down together and celebrate the end of the year. 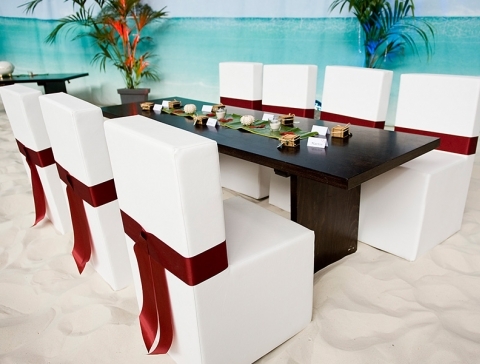 Whether you want to have a gala dinner or a beach party, our special beach at Beach Hamburg will create an unforgettable atmosphere for your Christmas party. What else could you need for your production? Have your dream wedding on the beach with family and friends here in Hamburg, without any need to travel far or worry about the cost of hotel stays. Our events team can give you individual guidance and will arrange the event precisely in line with your wishes. We don't only provide a highly unusual location, we will also be very happy to deal with all further details of your wedding so that you get everything under one roof and can be free to enjoy your special day to the fullest. Hamburg's most beautiful beach offers a great atmosphere the whole year round for you to celebrate special birthdays or family events with that great holiday feeling. Invite your friends to join you to party on the beach, with your feet in the sand and a cocktail in your hand, and take some time out together to escape from the daily grind.